In 2009, Scientists located a giant 13-billion year old galaxy at the edge of the observable universe. Detecting this huge galaxy was a challenge because of the massive quantities of light coming from the black hole, and if you think you spotted two problems in that sentence, read on. The galaxy, which is 12.8 billion light-years from Earth, is as large as the Milky Way galaxy and harbors a supermassive black hole that contains at least a billion times as much matter as does our Sun. "It is surprising that such a giant galaxy existed when the universe was only one-sixteenth of its present age, and that it hosted a black hole one billion times more massive than the sun. The galaxy and black hole must have formed very rapidly in the early universe," said University of Hawaii astronomer Dr. Tomotsugu Goto who discovered the object. "How can a galaxy be giant when it's the same size as our own?" is because of lightspeed – the galaxy is almost thirteen billion light-years away, which means it's almost thirteen billion years ago, which is almost as much "ago" as there is. When the universe was only about a billion years old even a Milky Way sized galaxy was pretty big, and the supermassive black hole in the center was impressively huge. Which brings us to the second issue: light coming from a black hole. Everyone knows that nothing can escape from a black hole, not even light, but that's only after matter passes the "event horizon" – the ultimate one-way sign in spacetime. But as matter falls in towards this cut-off point it's heated up by friction, radiating energy away as light, and this emission from infalling matter makes up over half of all the light detected from the distant galaxy. This is why we didn't see it before – a little thing like a few hundred billion stars was outshone by the superheated material around the black hole. 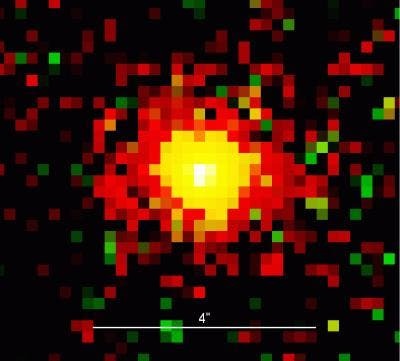 Detection was made possible by newly upgraded CCD (Charge-Coupled Device) Cameras fitted to the Suprime-Cam in the Hawaiian Mauna Kea observatory. The improvement was engineered by Professor Satoshi Miyazaki and colleagues of the National Observatory of Japan. The new early-stage black hole-galaxy system will be an important clue in the evolution of such supermassive black holes. While asking how they get so big might sound simple (they just keep eating stuff, including each other), their ability such spectacular size in so short a time isn't explained by any current creation theories. And by "spectacular size" me mean about a giga-Sun of mass. Yet another reminder of the amazing: our amazing ability to detect such incredibility, and the amazing universe where such awe-inspiring objects can be lost down the back of the cosmological sofa until we look really hard. Image top of page: is a false-color image of the QSO, the most distant black hole currently known. In addition to the bright central black hole (white), the image shows the surrounding host galaxy (red).